Musonius-esque living, Cynicism, Hercules, and the Pseudo-Lucian. I recently read “The Cynic,” by the Pseudo-Lucian. This work is a dialogue between Lycinus and an unnamed paragon of Cynicism. The dialogue has a Socratic feel, being mostly one of questions and answers. Also, Lycinus begins with the (mistaken) belief that he already knows a thing or two about a thing or two. Our Cynic, however, proves to him that he holds contradicting beliefs, which cannot stand with each other with integrity upon examination. There is a marked difference, in my estimation, to the Socratic dialogues, in that the Cynic also believes he knows something. These sorts of essays written under the auspices of other philosophers, often have a proselytizing component, as most of the Cynic Epistles did. For this reason, it’s not surprising then that our Cynic is in fact teaching explicitly. The Cynic explains after Lycinus’ first question, that he is no condition of want, his needs are fulfilled, and he is healthy. Lycinus then jumps into a description which I think lines up well with the modern person’s misconstruing of preferred indifferents (προηγμένα) in Stoicism. I’ve seen folks who seems to think the Stoic position prompts the pursuit of wealth, pleasure, and other things which a Cynic would call typhos (τυφώς), and then make similar arguments. This is not the case, by my reading, although it may allow for projects in these realms secondary to virtue. Yet, I still prefer that these projects ought to be built so as to train us for virtue, a point to which we will return shortly. Lycinus’ position is wrapped up in a strange theological argument; that to deny the bounty of nature and the ability of our bodies to take pleasure in these things which are provided is in fact a sort of impiety. Immediately after, however, he gets to the meat of it: he doesn’t like to go without the things he like. “To live without all these would be miserable enough even if one could not help it, as prisoners cannot, for instance; it is far more so if the abstention is forced upon a man by himself; it is then sheer madness.” Lycinus says. The Cynic responds with a point which is well at home in the world of Stoicism, that the manner in which we use these things is not in and of itself valuable, but only instrumentally so. The things are indifferent, but our intent and actions can have a moral component for our own virtue. We cannot inculcate σωφροσύνη (moderation, sort of [Wiki], [MS on food] ) if we don’t actually act out the virtue. Remember that you must behave in life as at a dinner party. Is anything brought around to you? Put out your hand and take your share with moderation. Does it pass by you? Don’t stop it. Is it not yet come? Don’t stretch your desire towards it, but wait till it reaches you. Do this with regard to children, to a wife, to public posts, to riches, and you will eventually be a worthy partner of the feasts of the gods. And if you don’t even take the things which are set before you, but are able even to reject them, then you will not only be a partner at the feasts of the gods, but also of their empire. For, by doing this, Diogenes, Heraclitus and others like them, deservedly became, and were called, divine. The Cynic takes it a bit further, expounding on the idea and pulling back the curtain on the illustration which in the Enchiridion is hinted at. … [T]he hospitable entertainer is God, who provides this variety of all kinds that each may have something to suit him; this is for the sound, that for the sick; this for the strong and that for the weak; it is not all for all of us; each is to take what is within reach, and of that only what he most needs. All of this goes to underscore the point that the Cynic’s goal is “enough” not a surfeit. He explains that his cloak meets his needs, his feet fulfill their function unshod, his body is adorned as a man’s ought to be, and the needs of his stomach met easily. It’s important that we also note a difference here between the Cynic school, our mother school, and the Stoic. Cynicism was descended from the Cyrenaics, where pleasure is held to be a good. It might seem strange at first that a school which held up ἡδονή (pleasure) as a good would chose to live as the Cynics did. Yet we see a parallel in the Epicureans, who espoused a more meager sort of pleasure, a simple kind. At this point our schools diverge, on the underlying moral values. The reasoning, though, is similar as it’s presented here. How we handle material, external, indifferent things has a moral component and matters in the practice and progress of our own virtue. The Cynic then proceeds to attach several luxuries in succession, pointing out the same rule, that a lack of want and glut are not the same. Afterwards, he turns Lycinus’ false piety on its head, and discusses the same purple dye we see from Zeno through Epictetus to Marcus: the murex and its blood. He states that to misuse this creature, not as food, but to color their clothes for aesthetic reasons is an impiety. 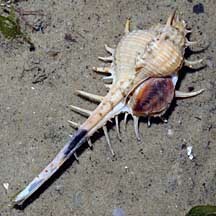 It’s interesting to me how this little shellfish dances through the Stoic canon and related works. If future Stoics are looking for an emblem of sorts, this little guy might make an interesting one. An interesting spin on Epictetus’ be the purple, maybe? I’ve chosen my own icon, but there is room for others. After this, we get another look at one of Seneca’s Sages, Hercules. In many ways, next to Socrates, Hercules is the patron of both the Cynics and Stoics, and Pseudo-Lucian shows us why. He closes with a long monologue, no longer fielding questions, but teaching as if a lecture, or public pedagogue. These externals that you pour contempt upon, you may learn that they are seemly enough not merely for good men, but for Gods, if you will look at the Gods’ statues; do those resemble you, or me? Do not confine your attention to Greece; take a tour round the foreign temples too, and see whether the Gods treat their hair and beards like me, or let the painters and sculptors shave them. Most of them, you will find, have no more shirt than I have, either. I hope you will not venture to describe again as mean an appearance that is accepted as godlike. … [T[he fact being that you in your own affairs go quite at random, never acting on deliberation or reason, but always on habit and appetite. You are no better than people washed about by a flood; they drift with the current, you with your appetites. Good article. 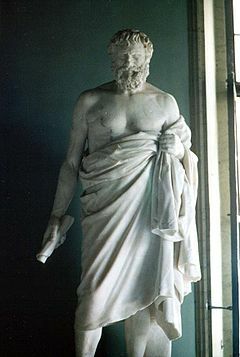 I think Antisthenes was the grandfather of Stoicism, not Aristippus of Cyrene. I would agree with that. There’s some debate about whether or not Antisthenes should be considered a founder of Cynicism, or just a patron saint (as it were). Most scholars that I’ve read do see a relationship between the Cynics and the Cyrenaics, however. I find Antisthenes the more interesting character, personally. I thoroughly enjoyed reading this essay, especially the part about the Cyrenaics. Their relationship with the Cynics is fascinating. Horace even suggests in his Epistles that they were occasionally more Cynical than the Cynics. 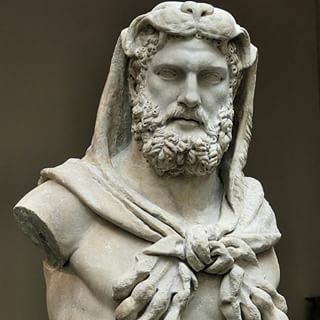 You’re probably familiar with the anecdote Horace alludes to: Aristippus wears a Cynic’s (possibly Diogenes’) tribon after leaving a bath, but the Cynic refuses Aristippus’ purple robe. I was very surprised the first time I read it.